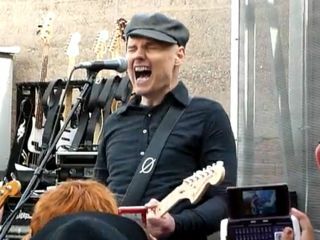 The Smashing Pumpkins played a free concert at Space 15 Twenty in Los Angeles this past Saturday to celebrate Record Store Day. Attendees included friends, family and 250 Pumpkins fans who'd pre-ordered the band's upcoming EP, Teargarden By Kaleidyscope, Vol. 1: Songs For A Sailor. Joining main man Billy Corgan were 20-year-old drummer Mike Byrne, who Corgan hired last year after an open audition, along with guitarist Jeff Schroeder, who has played with the band since 2007. Rounding out the lineup were bassist Mark Tulin of The Electric Prunes and Ginger Pooley, who guested on bass. Both members were temp only as a search is currently underway for not only a full-time Pumpkins bassist but a keyboard player, as well. Despite the we're-a-band-but-not-quite nature of the lineup, Corgan led the players through a spirited 75-minute set split evenly between new material and and sure-fire hits like Today and Bullet With Butterfly Wings. For an encore, Corgan took the stage with a ukulele and played a song called Baby that he said he'd written for two friends who'd recently given birth to daughters named Talulah. ("They're not mine," he added.) Then he brought out the band again for an extended, jammy version of Ava Adore. "We're trying to figure out a tour," Corgan told the crowd before he left. "Until then: heroin and fireworks."